With its stock price plummeting after missing second-quarter revenue expectations and news of venture investors heading for the exits, things aren't looking so good at Groupon. 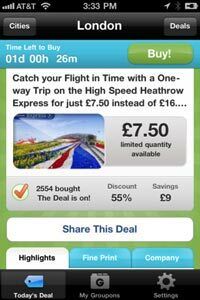 Whether the once high-flying daily deal rebounds, it's clear that mobile will play an increasingly central role in its fortunes. The same goes for Groupon rival LivingSocial. Mobile traffic for both sites now exceeds that on the desktop, according to an analysis published today by comScore. Including traffic from both its mobile site and Groupon Now app, Groupon in July drew 17.8 million unique visitors compared to 12.4 million on the PC-based Web. Likewise, LivingSocial had total mobile traffic of 8.8 million versus 7.3 million on the desktop. During Groupon's second-quarter conference call this month, CEO Andrew Mason highlighted the growing role of mobile in its overall business. In April, for instance, nearly 30% of transactions were completed on mobile, up from a quarter four months ago. “We’ve seen our mobile users drive more incremental revenue and purchase activity than our Web-only customers, with each mobile customer spending over 50% more,” said Mason. That suggests that if mobile use continues to expand for Groupon, it could also lead to higher conversion rates and higher spending per customer. The mobile contribution in the second quarter still wasn't enough to help Groupon meet analysts' revenue expectations of $575 million. But if the company's mobile transactions increased to half the total — on par with the 50% penetration of smartphones in the U.S.— it could bolster the revenue picture, or at least help offset slowing overall demand for daily deals. The comScore post also looks more broadly at what factors position some companies, including Groupon and LivingSocial, to make gains in m-commerce. One key is winning a place among the handful of mobile apps people turn to regularly for shopping. “For many consumers, Groupon and LivingSocial check that box,” wrote Andrew Lipsman, VP, industry analysis, at comScore. When a transaction is time-sensitive, as on a daily deal site or auction site like eBay, that helps ensure that consumers will want to remain keyed in on an app to capitalize buying opportunities. Inputting payment or account information on a small mobile screen, however, isn't easy. Any business where customers have already entered their personal information on the Web is at an advantage when it comes to m-commerce. People are more likely to purchase via mobile if they don't have to go through a registration process. Mobile also lends itself to getting local information and local commerce, benefiting locally oriented sites like Groupon, Foursquare and Yelp. The Groupon Now app, for instance, allows users to search for deals within a certain radius of their current location, creating greater incentive to use it on the go. Mobile transactions are still only a small proportion of overall e-commerce, but are growing steadily. The share of online sales from mobile devices in the second quarter increased to 15.1% from 13.3% in the first quarter, according to an IBM benchmark report. A wave of mobile payments initiatives, including Google Wallet, the recently announced Merchant Customers Exchange, and those from companies like PayPal and Square, are also expected to accelerate m-commerce growth. 2 comments about "Mobile Traffic Tops Desktop For Groupon, LivingSocial". Julie Larson from Divas Mobile Solutions, August 24, 2012 at 8:04 a.m.
All the more reason to heed Google's advice from TheMobilePlaybook.com - having a website mobile friendly should be your TOP priority! This is a great example of the difference being mobile friendly can make. Paul Baron from WebTel Marketing, August 24, 2012 at 11:31 a.m. The take-away from this for small business and national brands is that they should be doing their own proximity advertising and not giving up 30 - 50% of their revenue to these 3rd party daily deal vendors. Location Based Marketing to mobile consumers right at the point of sale makes sense. And for a small one time fee or even smaller monthly management of their mobile ad campaigns, they keep 100% or customers and profits. I'm happy to talk to anyone wanting more information - www.webtelmarketing.com for more info.